Fort Lauderdale, FL – The price of gas dropped for most people across the country during the past week, according to the latest release from the U.S. Energy Information Administration. However, substantial price increases in California and a smaller increase in gas prices in the midwest caused the national average to edge upward slightly. 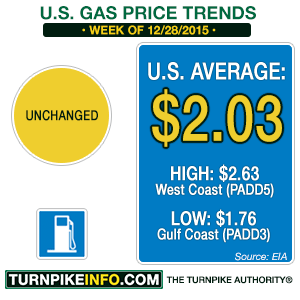 Nonetheless, the technical average remained unchanged on the week at $2.03 for a gallon of regular unleaded. For drivers in California, the price of gas went up a heart-stopping nine cents per gallon to settle at an average $2.83. That dragged west coast prices six cents higher on the week. Drivers across the midwest were hit with a price increase for the first time in over a month, as the cost of gas lurched upward by about three cents. Still, that region remains the second cheapest place in the country to fill up the tank. For all other survey regions, the price of gas was down on the week.